Foreign correspondents asked to leave enclave for social media posts on Hamas’ utilization of civilian sites to attack Israel. The international press in Gaza has hardly reported on how Hamas has operated in this round of fighting, and photos or video of Hamas fighters from recent weeks are rare. Some journalists denied being threatened while reporting from Gaza, though other accounts from recent days paint a different picture. Some journalists from international news outlets denied being threatened or intimidated by Hamas while reporting from Gaza, though other accounts from recent days paint a different picture. In recent weeks, there has been much discussion about whether or not reporting by foreign press in Gaza can be trusted, due to accounts – some confirmed, some denied – of Hamas threatening and intimidating reporting. The Jerusalem Post attempted on Thursday to contact ten journalists who reported from Gaza in recent weeks. Of the few who responded most declined to be interviewed, even on condition of anonymity, as they plan to return to Gaza to report. Christian Stephen, founder of “Freelance Society,” a media company specializing in hostile environments and conflict zones, which sub-contracts for The Economist, VICE, Vocativ and other press outlets, agreed to discuss his experience reporting from Gaza, because he is in Israel and heading to Iraq in nine days. 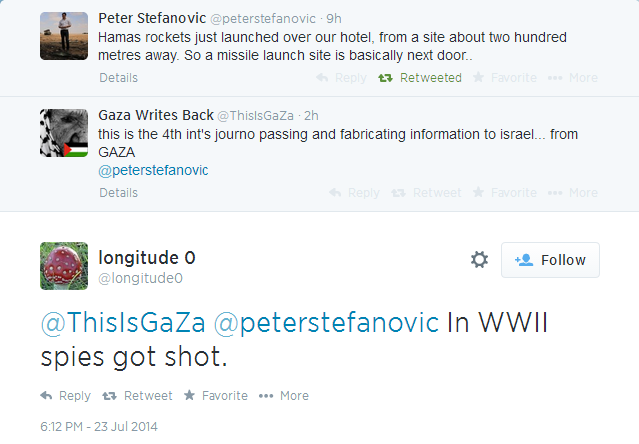 Hamas has threatened journalists to punish journalists who record Hamas firing rockets. Hamas is using threats and pressure to prevent journalists from providing objective reports, the Foreign Press Association in Israel said in a statement Monday.